SOA is far from dead but many organizations suffer from a severe SOA disease caused by too many enthusiastic deployments of isolated and siloed services. 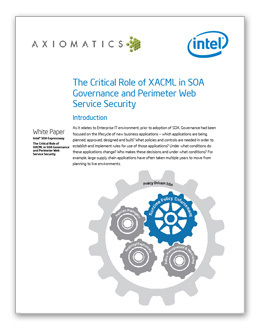 In this webinar, Martin Kuppinger will provide you with insights on SOA Governance, followed by Axiomatics and Intel showcasing their joint SOA security solution. This Webinar is supported by Axiomatics and Intel. Axiomatics is the leading provider of fine-grained access control. Axiomatics’ solutions are utilized by government agencies and Global Fortune 1000 companies around the world to enable digital transformation: share and safeguard sensitive information, meet compliance requirements, and minimize data fraud. Axiomatics provides Attribute Based Access Control (ABAC) for applications, databases, Big Data, APIs and microservices. To learn more please visit: www.axiomatics.com or @axiomatics. SOA Expressway is a service gateway soft-appliance deployed to address common XML and SOA problem areas such as acceleration,security, service mediation and service governance. SOA Expressway is available for any organization deploying services (SOA) or looking to reduce security risks for access to cloud services. It is “ecosystem neutral” and integrates with existing identity management, middleware and security monitoring investments. SOA Expressway is available for standard operating systems such as Windows and Linux and requires no special custom hardware other than standard OEM servers. Regain control….secure the dynamic perimeter.